Owners of large-scale offices, warehouses, and shopping centres are increasingly targeting zero emissions and installing solar power to attract new tenants and prospective buyers, reports The Sydney Morning Herald. Once buzzwords, today “sustainability” and “going green” mean both serious environmental and financial business. Having a high green star NABERS (National Australian Built Environment Rating System) rating is as necessary and in demand as a front door. Solar panels are also included as part of the asset to help keep electricity costs in check for owners and tenants. Towards this end, the Green Building Council of Australia (GBCA), has just released a discussion paper, A Carbon Positive Roadmap, which establishes the steps required for commercial, institutional and government buildings and fitouts to decarbonise. The roadmap has been developed to help ensure Australia’s competitiveness and attractiveness for investment while fulfilling international commitments to reducing carbon emissions. “This roadmap was developed as a response to GBCA’s vision of healthy, resilient and positive places for people and the natural environment and is the result of extensive industry and government consultation and engagement,” GBCA chief executive Romilly Madew said. Property landlords leading the charge include GPT Wholesale Office Fund, Lendlease, Frasers Property, Stockland, Integral Group, AMP Capital Wholesale Office Fund, Mirvac, CBRE, and Dexus. GPT said it would aim for a net zero carbon emissions portfolio by the end of 2020 – easily the tightest target in the A-REIT sector (Australian real estate investment trust) so far, notes The Fifth Estate. The target is five years ahead of the next closest: Lendlease’s Australian Prime Property Fund Commercial’s (APPFC) target for net zero carbon by 2025, which was announced earlier this year. Mirvac and Dexus aim to be net zero carbon by 2030, while Investa is aiming for 2040. To meets its target, GPT plans to slash energy consumption in its buildings, invest in more on-site renewable energy generation, and buy renewable energy, says the AFR. This will involve rolling out energy efficient LED lighting across its portfolio, the installation of photovoltaic solar cells on several office buildings and securing long-term contracts with renewable energy suppliers. The company will also trial battery technology to reduce energy costs and dependence on the grid during peak demand periods. Mr Ritchie said expectations are that the installation of LED lights across the $7.5 billion GWOF portfolio alone will reduce energy costs by around $600,000 a year and cut carbon emissions by 3000 tonnes a year. Shopping centre giant Vicinity Centres is investing $50 million in the expansion of its solar program across a further 17 shopping centres across Australia. It has already spent $28 million towards solar installations at five centres across South Australia and Western Australia. Being green also gives landlords highly prized kudos. 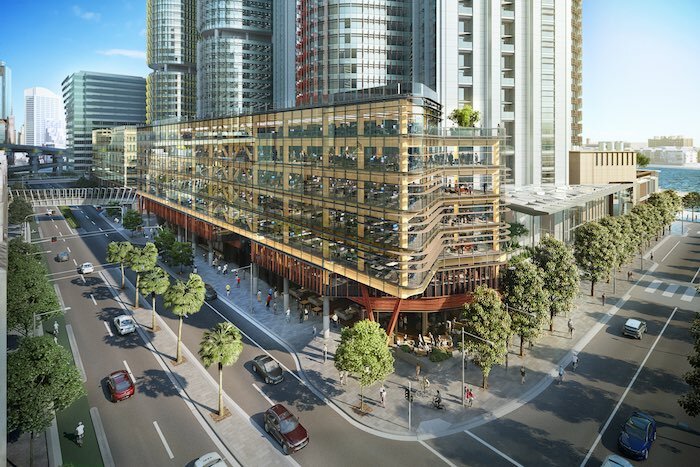 Last week the World Green Building Council named Lendlease’s Barangaroo South and Aorangi House in New Zealand as co-winners in the Leadership in Sustainability Design and Performance in the commercial category, at an awards event in Singapore last week. Barangaroo South has now won more than 50 local and international awards ranging from design excellence and product innovation to sustainability excellence. Urbanisation and density are on the rise, with the vast majority of all global population growth expected to occur in our cities. “The onus is on us to design, develop and build cities with sustainability at the forefront because it’s increasingly critical to everyone’s quality of life,” said Kylie Rampa, chief executive of property at Lendlease.